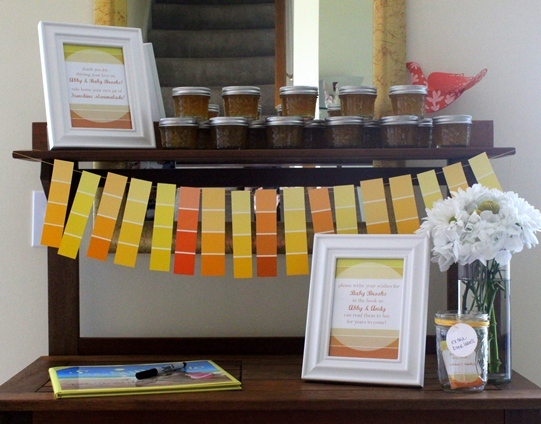 I am so excited to share this baby shower I co-hosted for one of my very best friends! 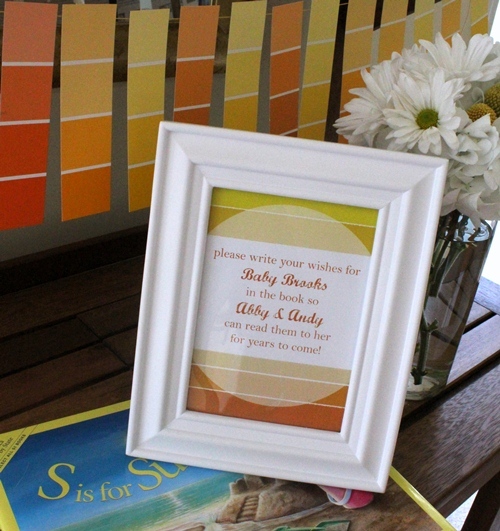 When choosing a theme, I knew that “You are my Sunshine” would fit well because the mom-to-be’s favorite color is orange and she loves the beach and sunshine :) With this theme, I thought an ombre color palette of bright yellows and oranges would work perfectly. Luckily, the other friends helping plan the shower completely agreed! They let me focus on the decor (my favorite aspect of party planning!) while they took care of a delicious brunch and mimosas. YUM. Once we’d decided on a theme, it was time for the invitation. I was very nervous (and excited) to try my hand at designing the invite and was very happy with how it came out! Check it out here – You are My Sunshine Invitation! With the invitation, I included a customized bookplate for guests to stick on the inside of a baby book. 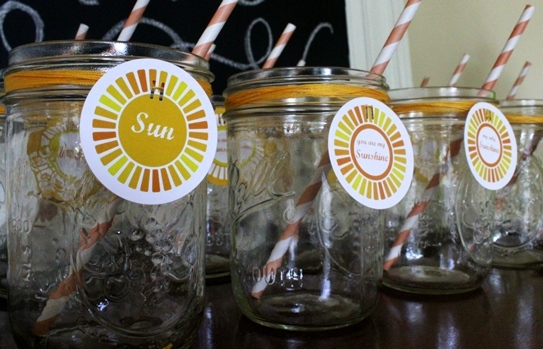 I see this at a lot of baby showers and I love the idea! Books are one thing it is hard to have too many of and you can buy a board book for about the same price as a card! 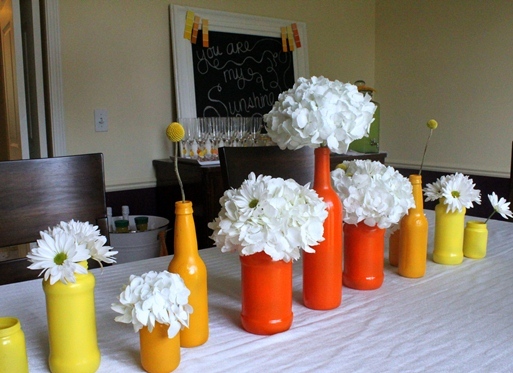 For the table centerpieces, I took a collection of up-cycled food jars and bottles (some were first used in my Woodland Fairy Birthday Party) and spray painted them yellow, mango and orange. I definitely had a full day of spray painting getting these vases ready, but I loved how they turned out! I can’t even imagine how much a set of vases in the perfect colors would have cost (or where I might even be lucky enough to stumble on them! ), but all of these vases only cost me $9 because I’m pretty diligent on saving every.single.jar that comes through our house! 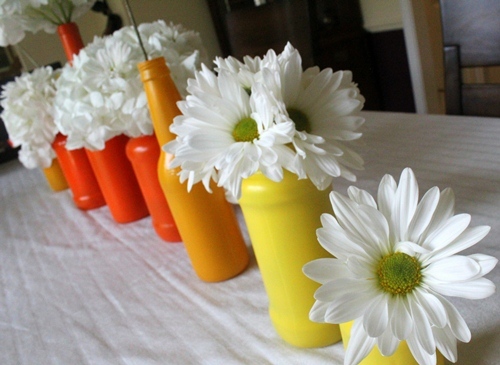 Because I went with colorful vases, I kept the flowers themselves monotone with white hydrangeas, white daisies and yellow craspedia billy balls. The vases lines the center of the two tables as well as the mantel, where I loved how the colors popped off their gray walls. I also added a fabric bunting on the mantel made of the leftover napkin fabric. It was a very quick and easy to put together bunting that added a lot of color – I will definitely be making one of these again! Speaking of the napkins, I went the easy route and bought fat quarters of fabric that I cut with pinking shears to keep from fraying. Here is where I have to give a full disclosure…I cut them before washing them, so of course I had to cut them all again after they came out of the dryer since they were completely frayed! I won’t make that mistake again! Even so, they added a great pop of color and, if we’d done place settings instead of a buffet, they would have looked great set on each plate. Since we would be serving mimosas, a drink station was in order! 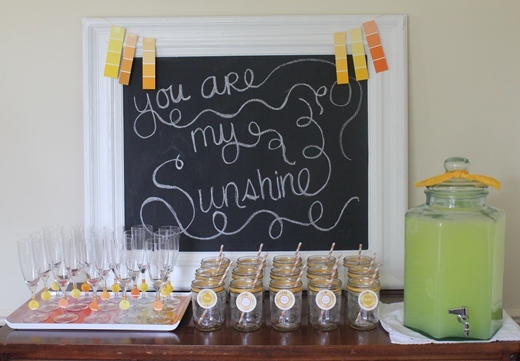 We set it up with my large chalkboard, mason jars, and champagne flutes. 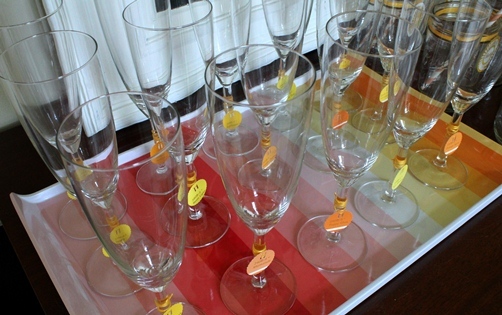 One of my friends let us borrow her champagne flutes (used at her Champagne Birthday Party), which I arranged on an ombre tray (so excited to find a piece in a store that matched so well!). 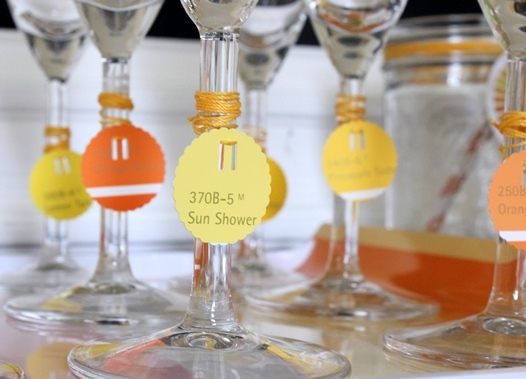 For champagne flute tags, I used a small circle punch to cut the paint names off from paint chips and threaded them onto the stems with crochet yarn (this is my cheap imitation of baker’s twine!). This may have been one of my favorite details of the party! The reason I had paint chips to begin with was to create a paint chip garland for the favor table (inspired by Jones Design Company). Paint chips work just perfectly with any ombre theme! I simply cut them into three strips and taped them onto my crochet yarn! 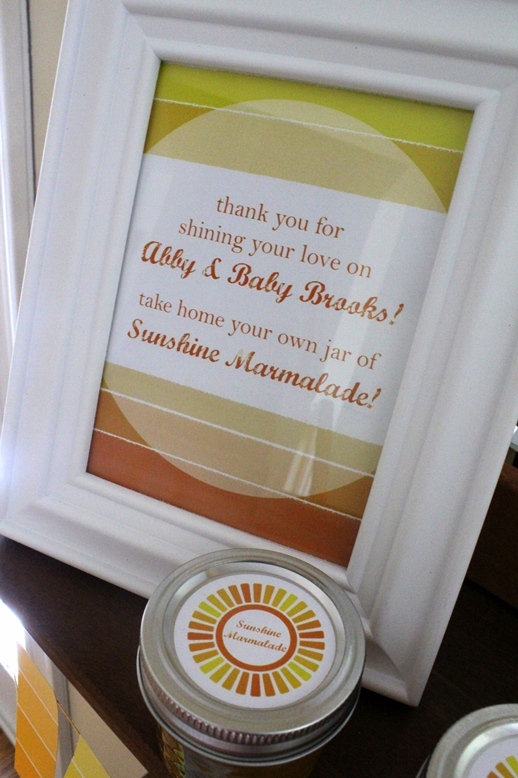 For favors, I made mini jars of peach marmalade (a nod to the fact that daddy-to-be is British) with “Sunshine Marmalade” labels. As a memoir for baby-to-be, we had everyone sign in the book “S is for Sunshine, A Florida Alphabet” – particularly fitting because this family loves to vacation in Florida! I had so much fun planning this party and just cannot wait to meet my newest “niece”! 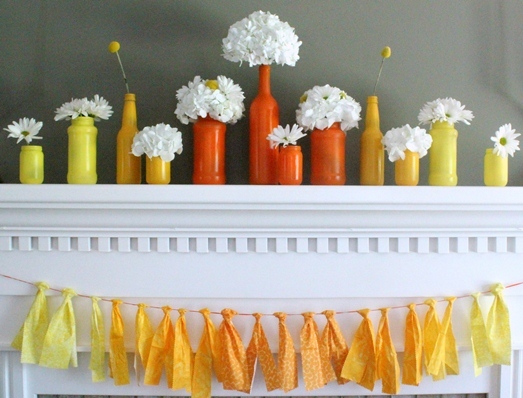 This entry was posted in Event Portfolio, Party Inspiration and tagged baby shower, lemon, orange, yellow. Bookmark the permalink. That first photo takes my breath away. Those colors against the gray? Stunning! Everything was absolutely gorgeous. I’m especially impressed with the printables you designed. The invitation, the tags, labels, etc. They’re perfect! And the squiggly curly-que writing on the chalkboard is precious!